About the company - ALKA KOVO SERVICE s.r.o. We present you the company ALKA KOVO SERVICE s.r.o that has been established in February 2015 as the successor of the company ALKA KOVO s.r.o. established in 1998. The company ALKA KOVO SERVICE s.r.o. is specialised in the locksmith´s production and assemblies of technological equipment. Within the reorganisation of the company ALKA KOVO SERVICE s.r.o. the company ALKA KOVO s.r.o. has gradually taken over all activities and liabilities in 2015. Production premises of total surface 1 500 m2 equipped with an overhead crane, workplaces for material cutting, sand blasting box, welding workplaces, machining shops and assembly premises with standing cranes are found in Boršice at Buchlovice. 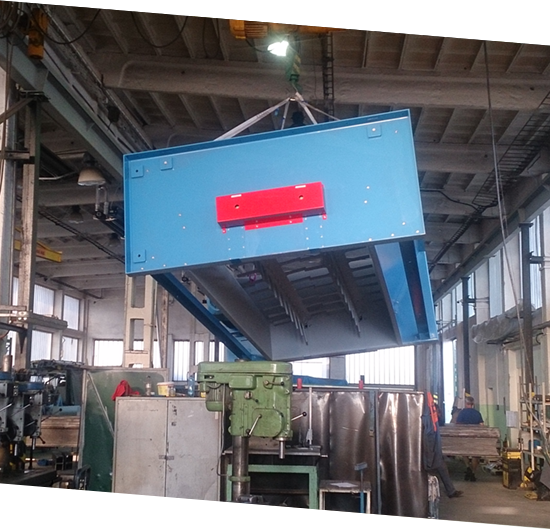 The main company´s specialisation consists in work production of steel weldments, production and assembly of roller, chain and belt conveyors, including the surface treatment and metal-working using conventional machines as well as CNC milling centre. The company deals with assemblies of technological devices and ensembles, assemblies of designated gas devices focused on technical gases, production and assembly of pipelines, source and evaporating stations of technical gases, assemblies of CNG and L-CNG stations, including testing and revisions. The company also performs the move of technological devices and production lines. ALKA KOVO SERVICE s.r.o. is based on a very close cooperation with the client based on the high quality of products, short delivery terms and permanent improvement of service for every customer. The qualified team of our employees is ready to solve with the client any technical or logistic issue related to the quality or deliveries.